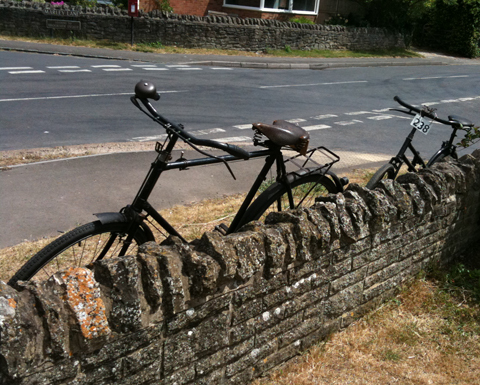 29th June 2010: I’ve spent the past 2 weeks setting up this bike. 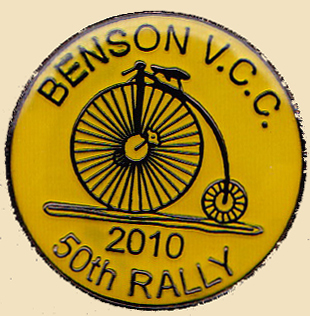 I intend riding it on the Benson Run in five days time. 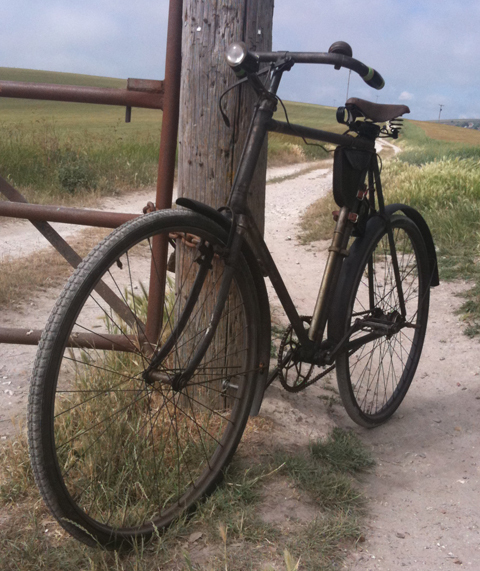 Today was my first ride out on it. 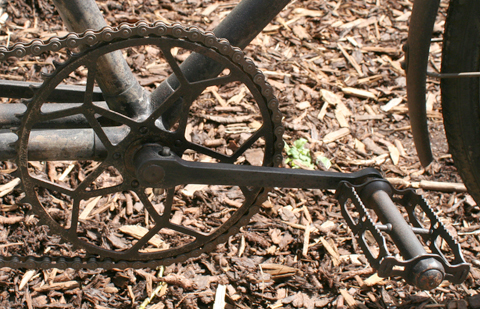 It’s four inches too high for me, so the good news is that I can actually ride it. 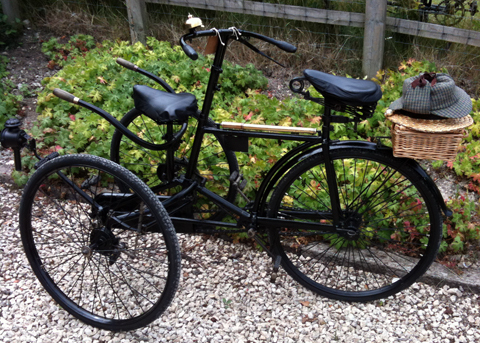 It also has 16 inch handlebars: if you’re the correct size for this bike (6ft) your knees would bang on the grips. 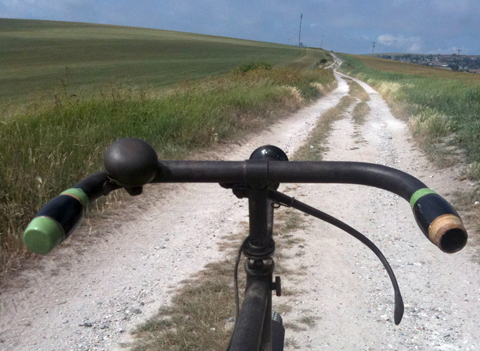 I’m 5′ 8″ so I have to jump on and off, but at least the handlebars aren’t a problem. 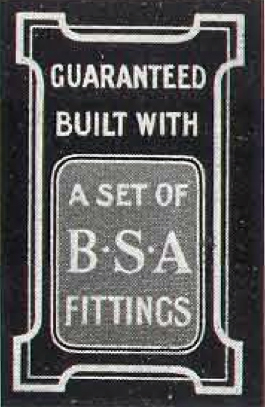 This seems to be the debut of a BSA Fittings Machine on the internet. 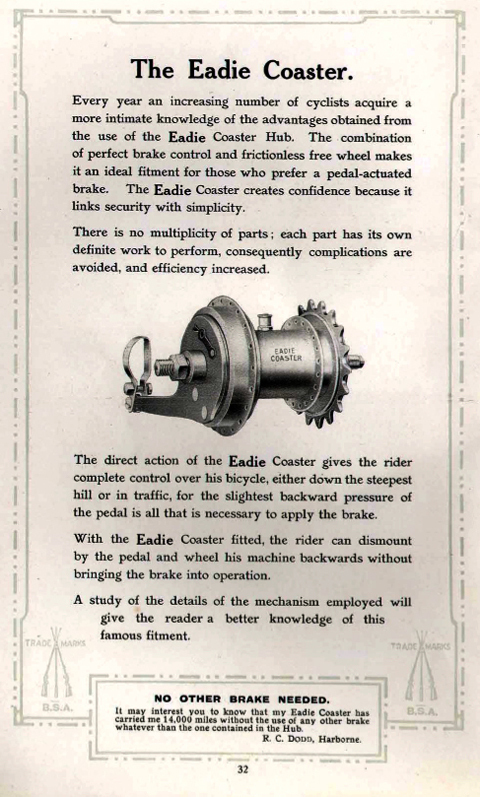 So, while working on the bike, I’ve also enjoyed researching it. 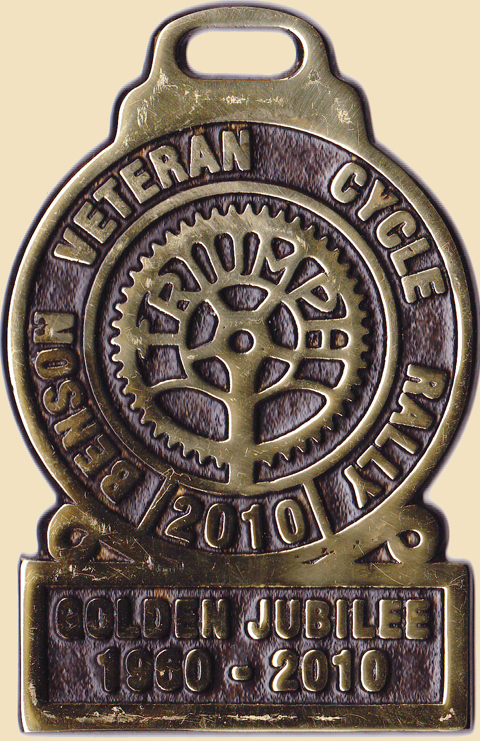 Based at Small Heath, Birmingham, the company was originally a munitions manufacturer, formed from a coalition of sixteen firms in 1861. 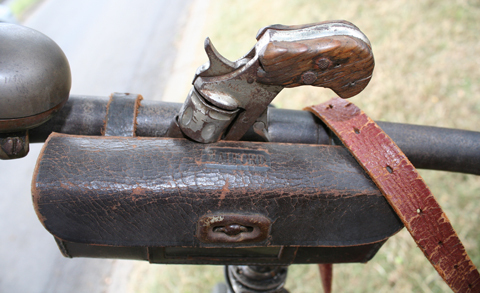 It’s believed that BSA made the Delta around 1869. 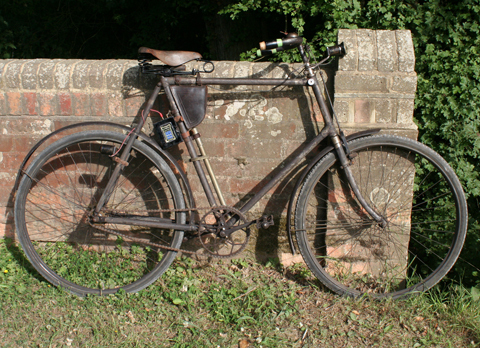 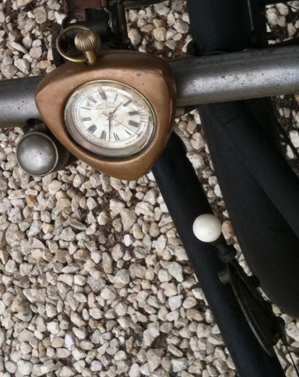 In 1880 BSA supplied 210 Otto Dicycles; a further 753 were subsequently made. 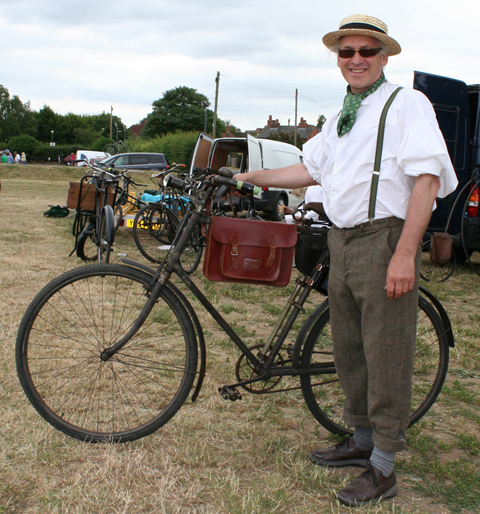 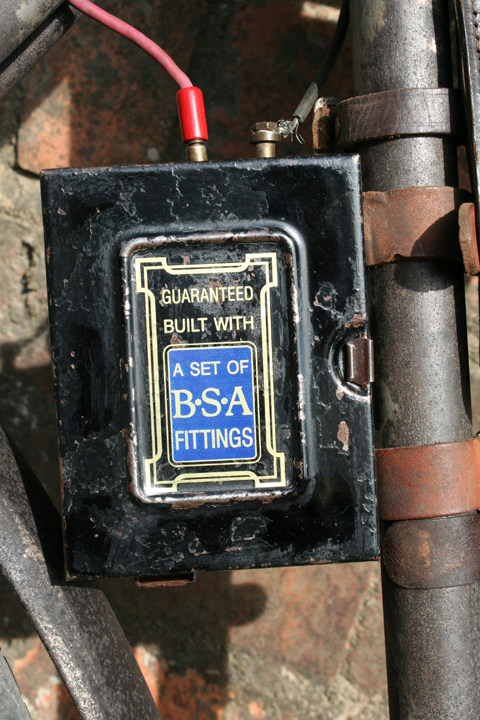 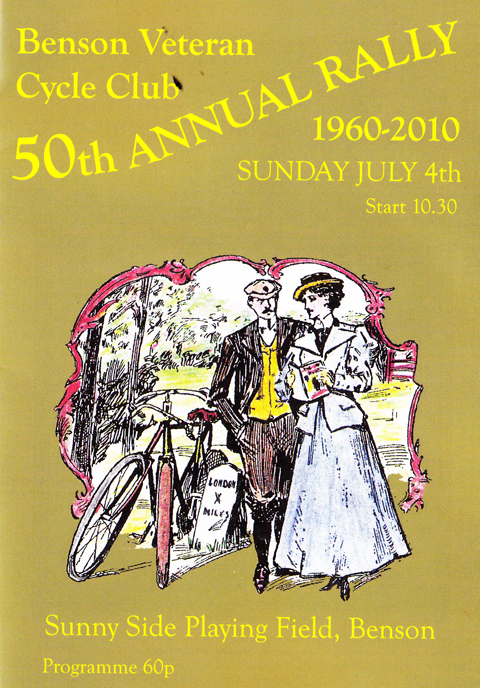 In 1881 BSA started making their own machines, exhibiting at the 1881 Stanley Show. 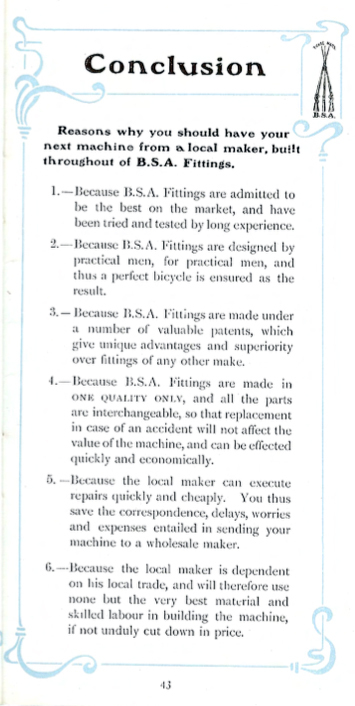 200 Omnicycle tricycles were made for N. Salamon on behalf of the Bicycle & Tricycle Supply Association. 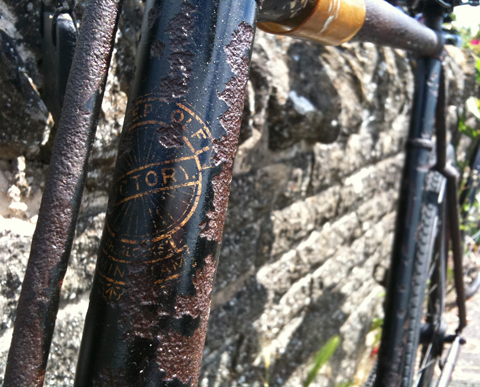 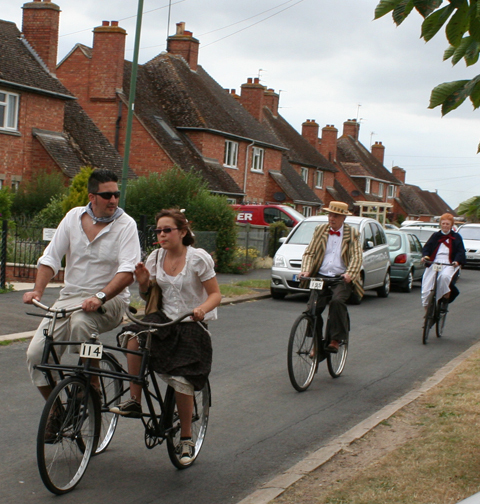 In February 1882 the company installed its own plating plant and made 200 Devon tricycles to order. 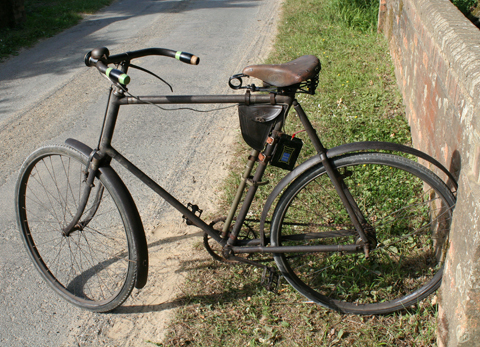 The same year saw the manufacture of a folding tricycle. 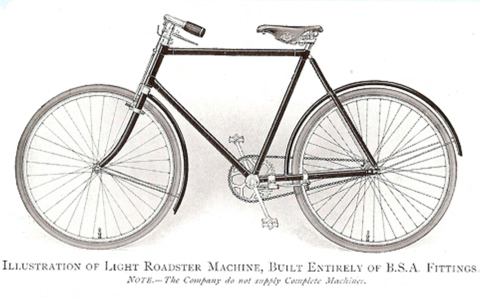 It appears that the first complete bicycle, an Alpha high-wheeler, may have been produced as early as 1881-82. 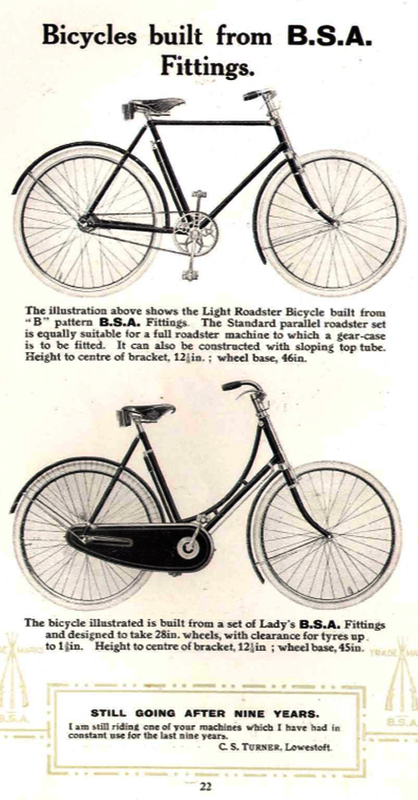 In 1884, following the production of two prototypes of a lady`s bicycle for H.J Lawson, the company went on to design and produce its own BSA Safety (patent 1884/15,342 of 24 November 1884) of which over 1,500 were made. 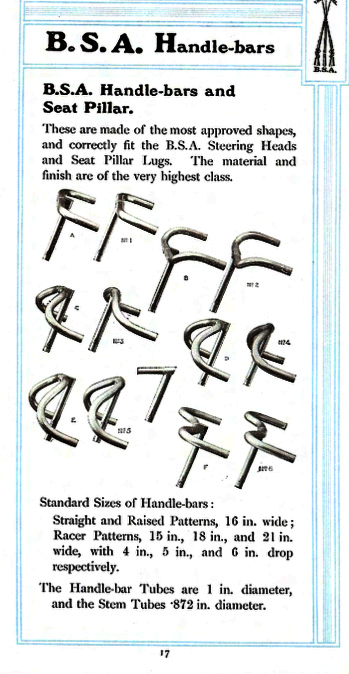 They sold at £9.9s. 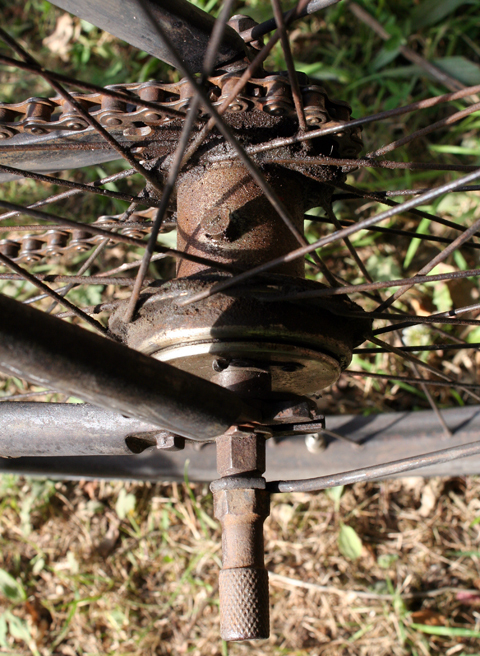 Beta and Delta tricycles were made from 1880, and the Compressible tricycle from 1883. 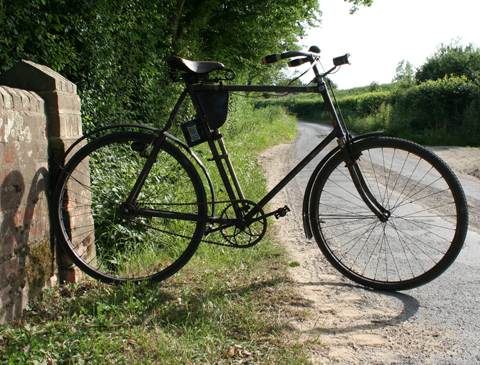 The Devon tricycle was made for Maynard, Harrison & Co from 1882 and also the Rucker for M. D. Rucker & Co. from the same date. 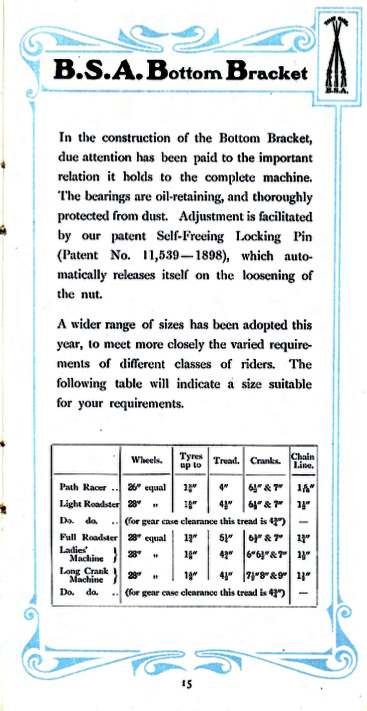 A licence to manufacture ball bearings was obtained in 1885. 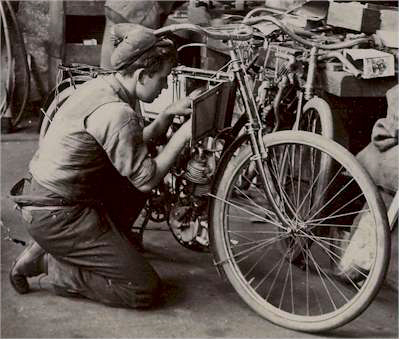 In 1887, it was decided to discontinue cycle production, but a return was made in 1893 with the manufacture of bicycle parts to utilize redundant machinery. 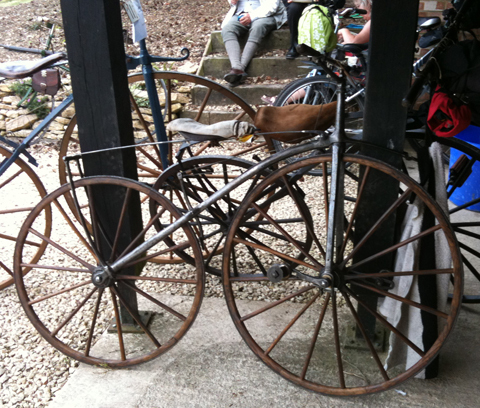 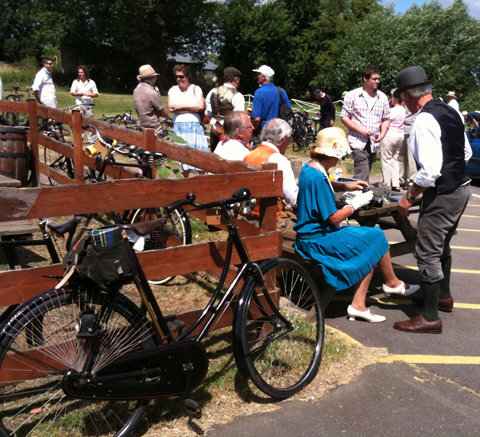 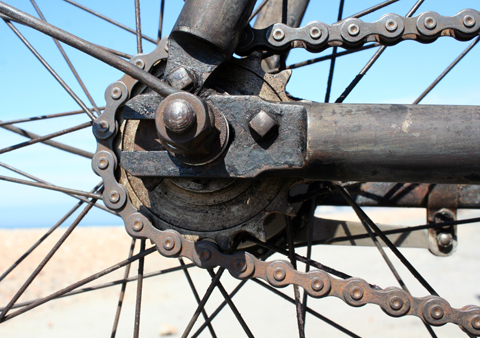 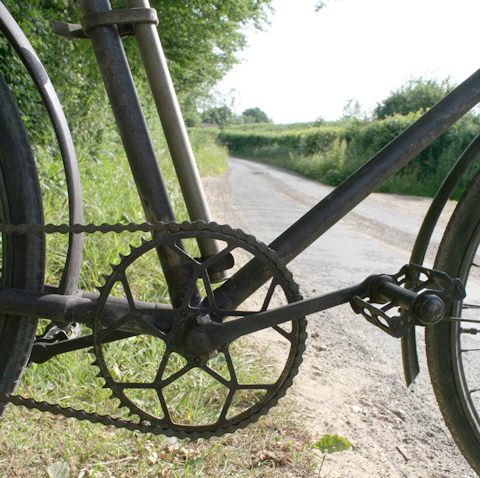 Components such as hubs, brackets, cranks, chain wheels, chains, pedals, and BSA spanners were made from 1894. 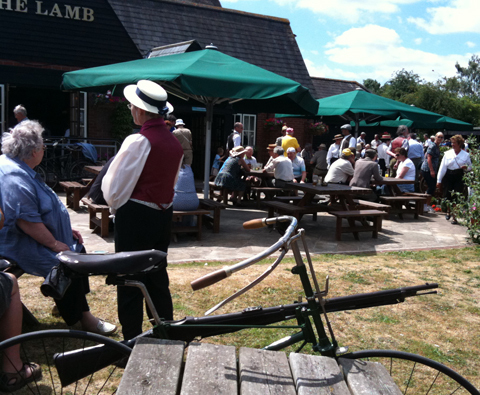 By 1896 the factory had grown to cover ten acres. 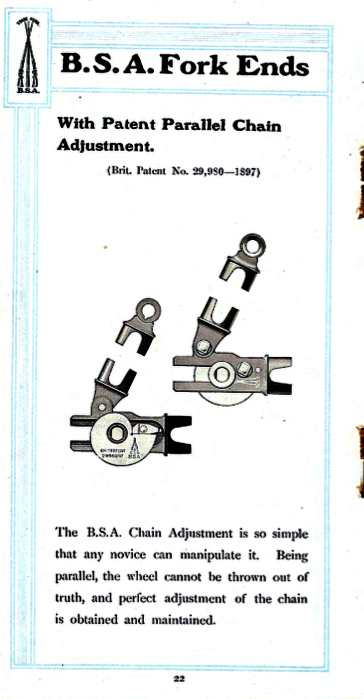 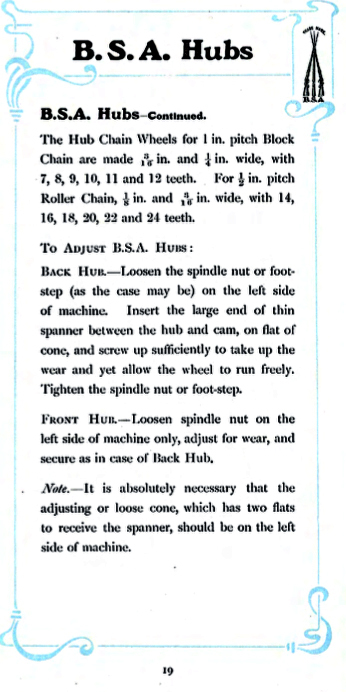 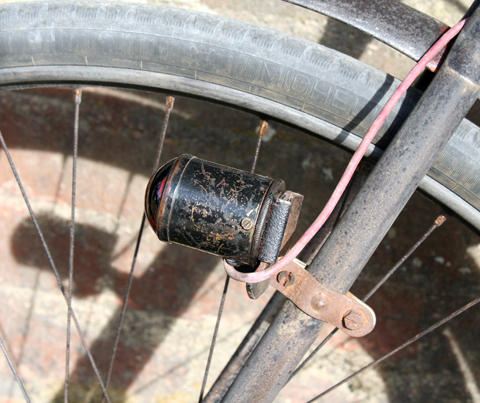 The BSA cam chain adjuster was patented in 1897 (1897/29,980). 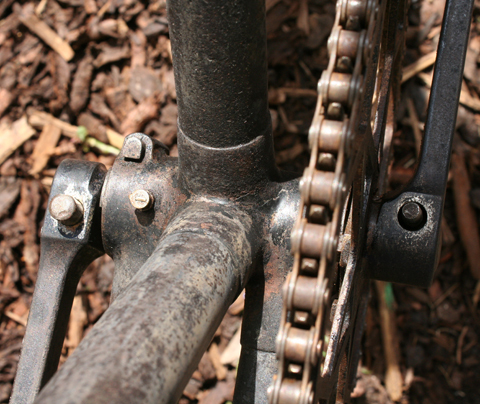 Adjustment was effected by a volute cam on the inner side of the chainstay, with a variable-length pressure block abutting against the cam, so giving an initial adjustment of the chain. 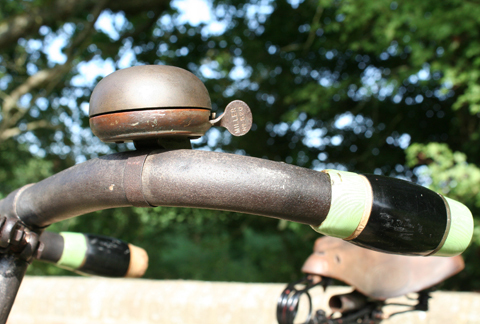 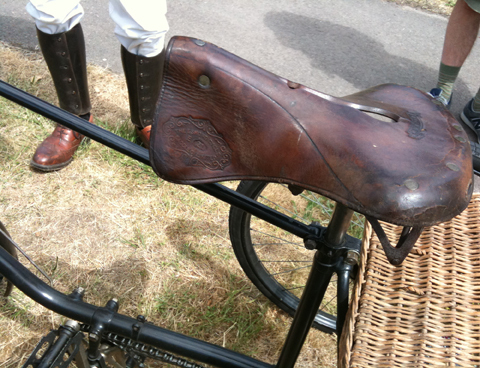 This was still being fitted to cycles in the 1920s. 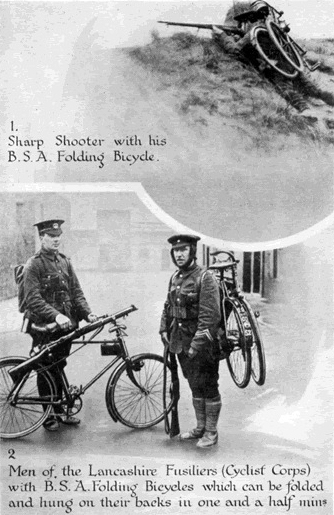 A folding bicycle was produced for military use in the Boer War (1899-1902), which was also used in the First World War (see below). 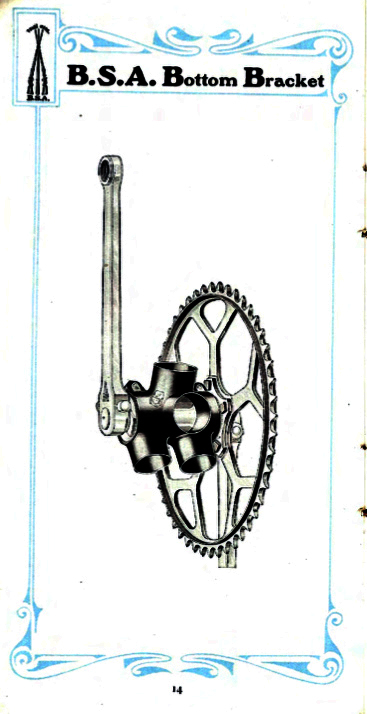 Chainrings up to 1899 had no more than 20 teeth and straight arms; from 1899 to 1903 the chainring was detachable and had `Y` arms; from 1904 to 1908 the arms took the form of an `X`, and from 1908 the letters BSA were included. 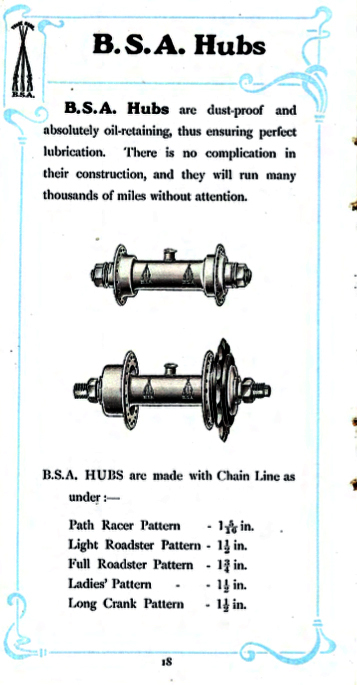 (See the chainring chart further down the page). 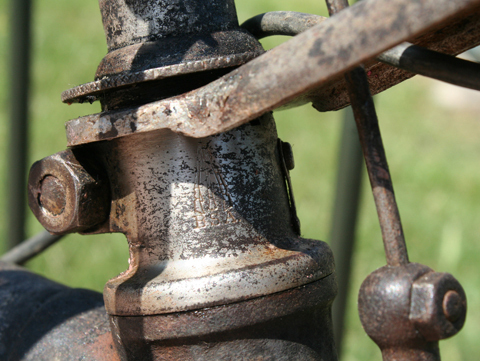 A spring frame (invented by Dr. Mansell-Jones) was exhibited at the Stanley Show in 1900 and a considerable quantity were produced. 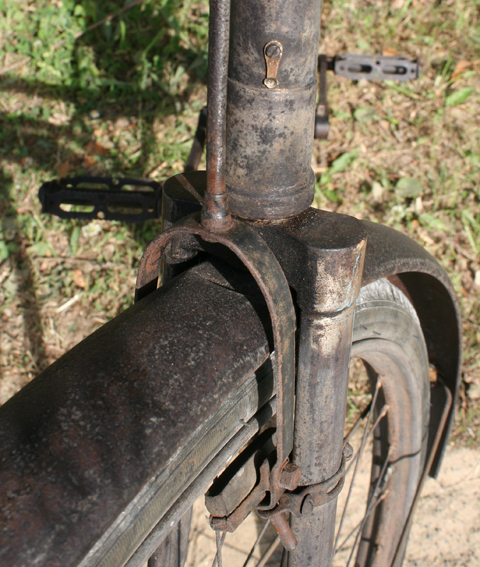 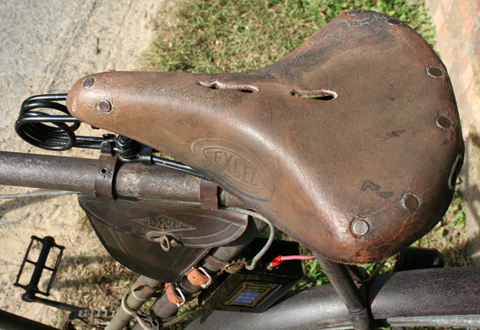 The top tube and both seat stays were telescopic, containing coil springs with pivots at both ends of the top tube, at the top of the seat stays and at the bottom of the down and seat tubes. 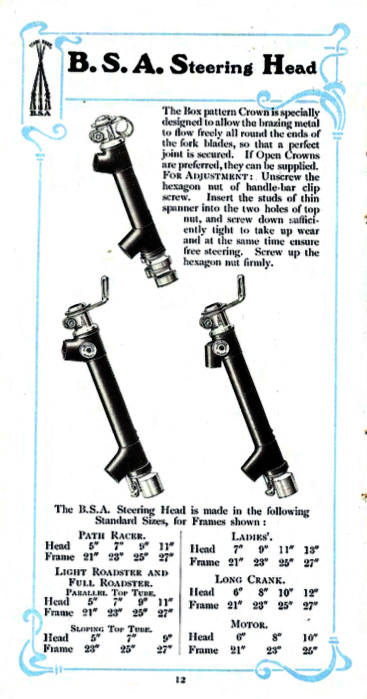 The BSA spring frame was ideal for mounting an engine. 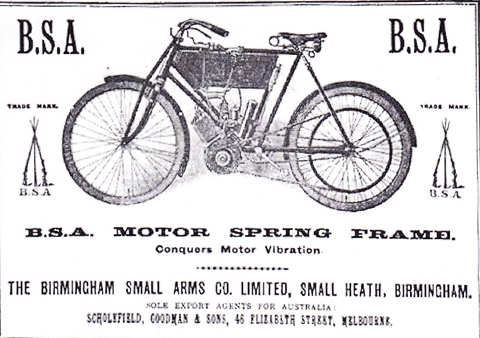 The 1904 spring frame pictured below, fitted with a 1903 Minerva engine, is a typical early motorcycle assembled in Australia. 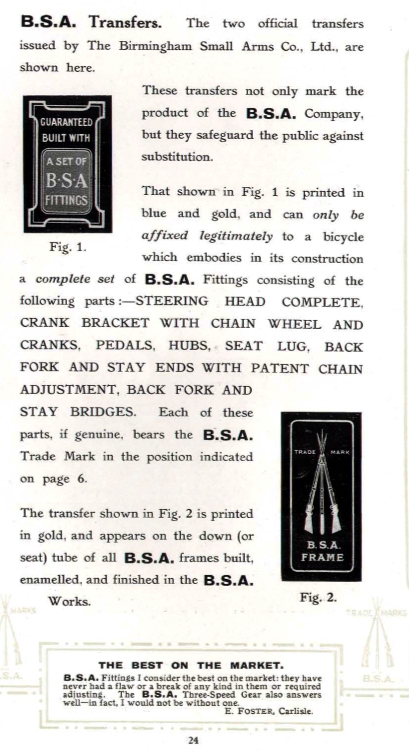 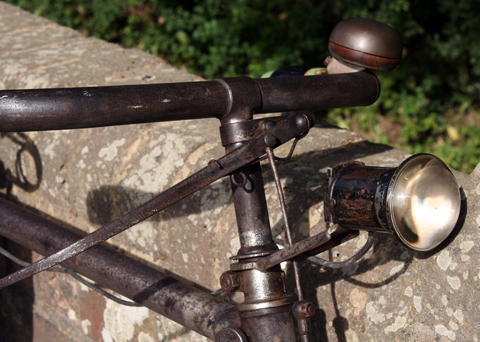 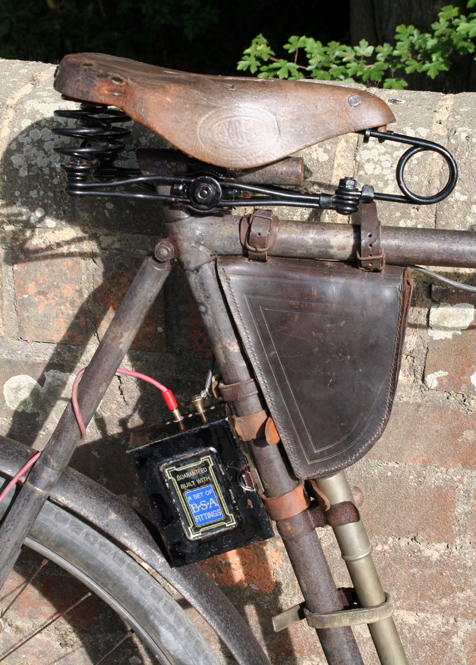 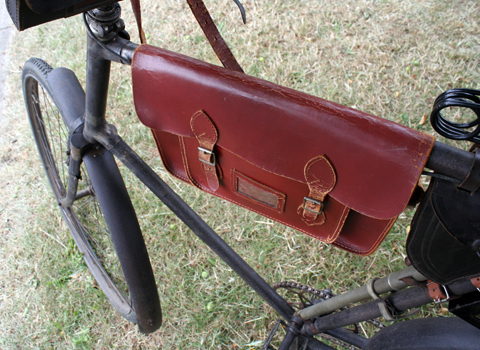 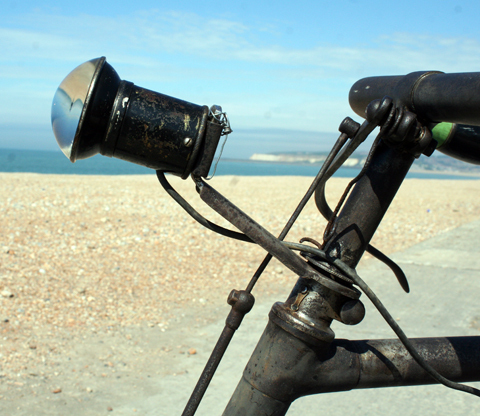 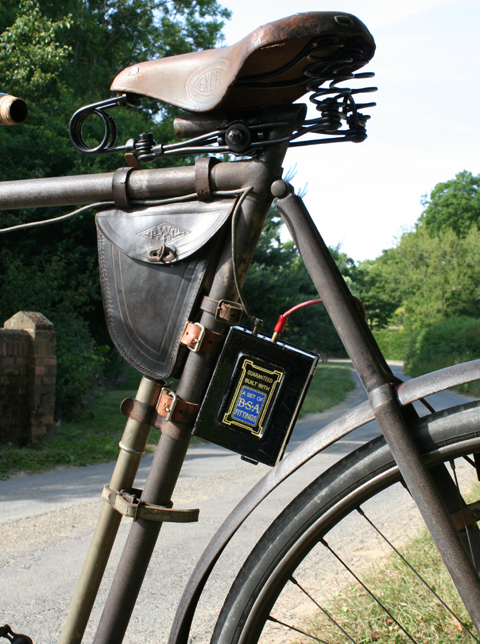 In 1902, the War Office adopted BSA Fittings for Military Bicycles, and the majority of bicycles used by the War Office from that time onward were built of BSA Fittings. 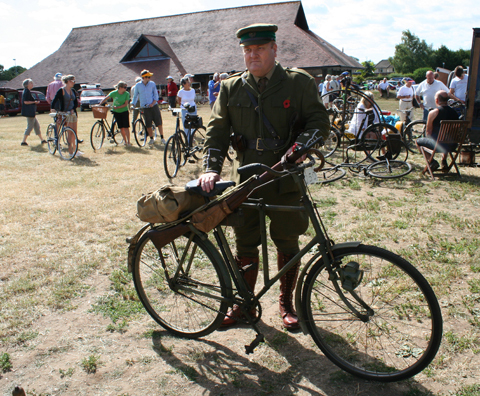 No higher compliment could be paid than this adoption by the War Office of the productions of the Cycle Department, after their many years’ experience of the absolute reliability of the firm’s rifles. 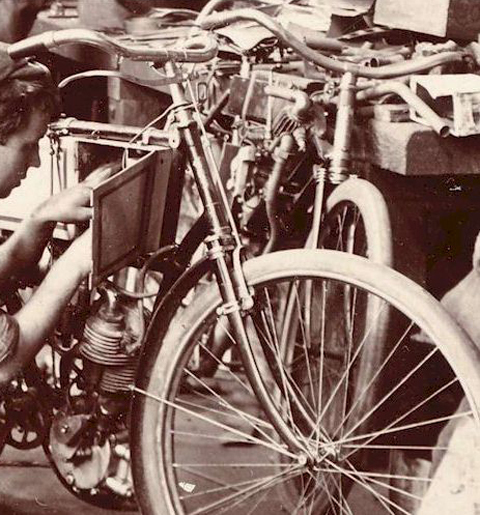 You can see the BSA fittings on the machine pictured below at Lewis Cycle and Motor Works in McHenry St Adelaide, around 1904. 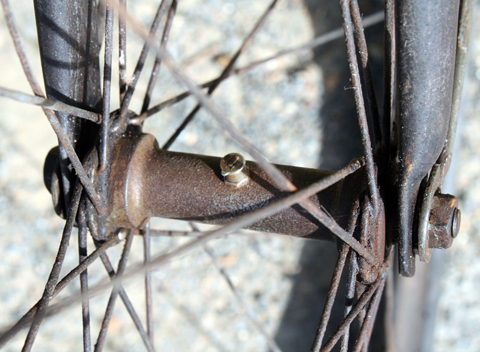 (Photo courtesy Leon Mitchell**). 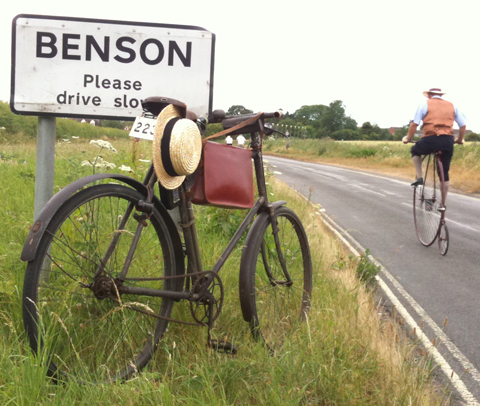 The speed limit in Great Britain had been set at 14mph in 1896. 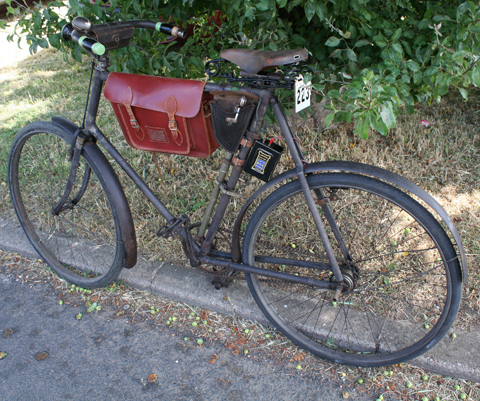 In 1904, thanks to campaigning by the recently formed RAC and other bodies, it was raised to 20mph. 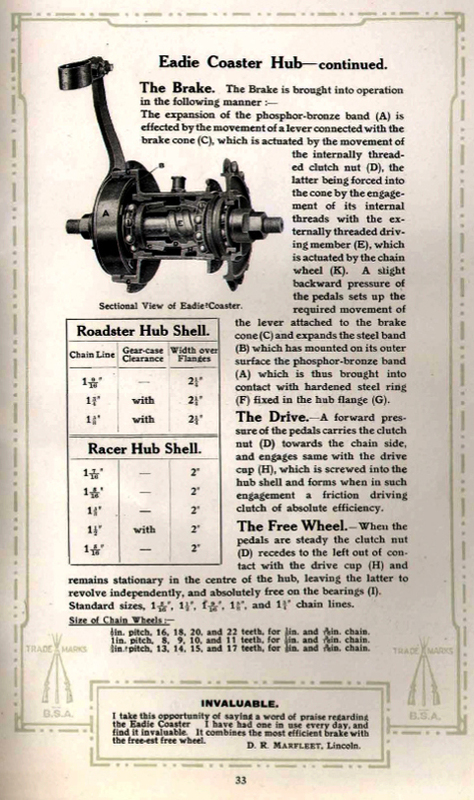 But Australia had quite good roads extending through thinly populated districts, and the authorities did not object to speedy travelling. 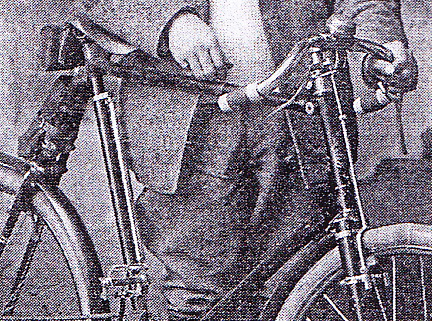 According to Bicycling News of 11th February 1903: “according to this state of affairs, the world’s record of 460 miles in 24 hours on a motor bicycle has been set up by Mr. H.B. 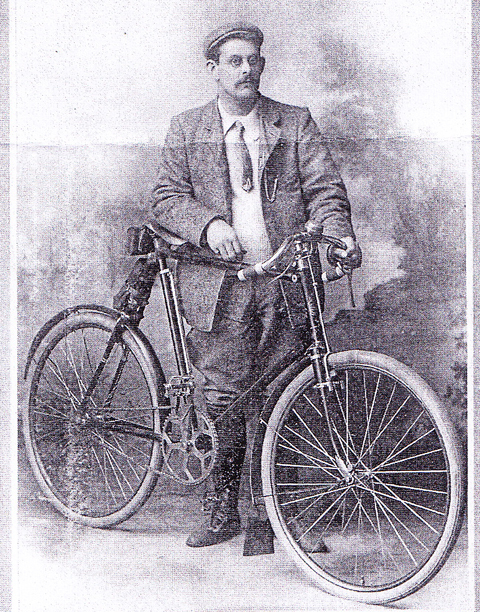 James of Melbourne” riding a machine designed and made by local bicycle maker Ernest Beauchamp. 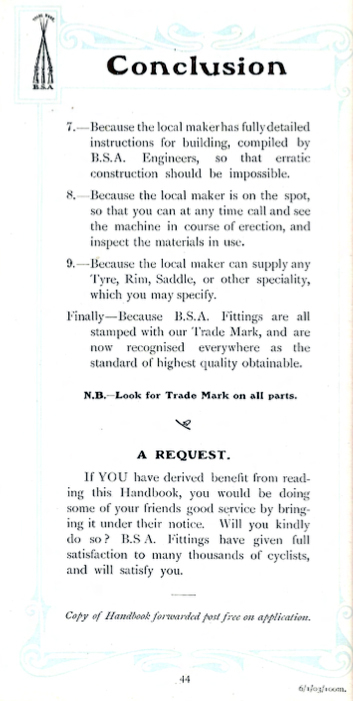 In 1907 there was an amalgamation with the Eadie Manufacturing Co. 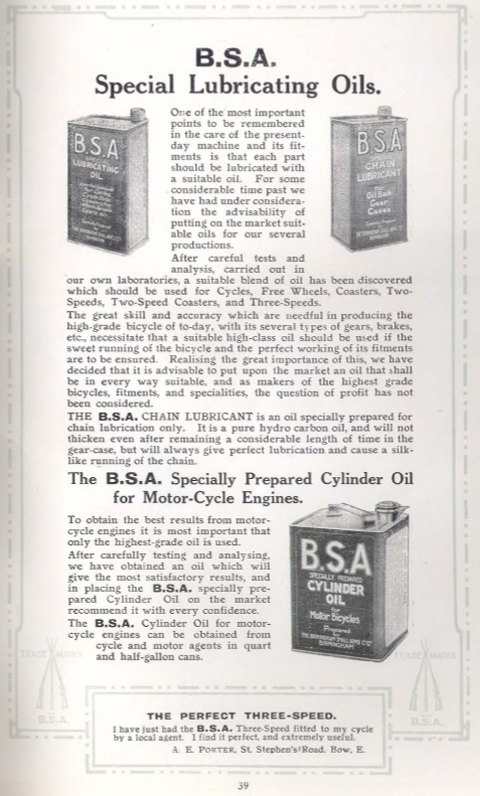 In the same year, BSA re-organized their advertising dept, with the appointment of a new manager Edward Louis Maxwell (who had been the advertising manager at Gamages). 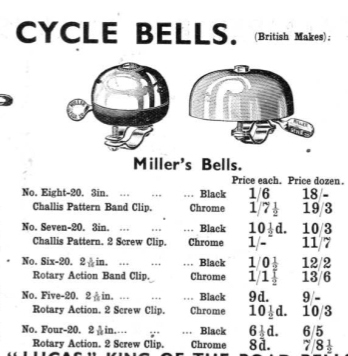 According to Cycling magazine (November 1907), Maxwell had worked in advertising for 15 years in America and England: this was essentially the most fascinating time for both the cycle and advertising industry, establishing both into the form in which we know them today. 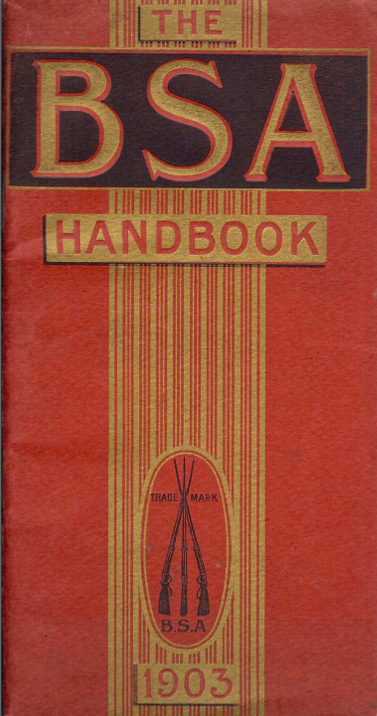 Maxwell wrote a book entitled Modern Advertising. 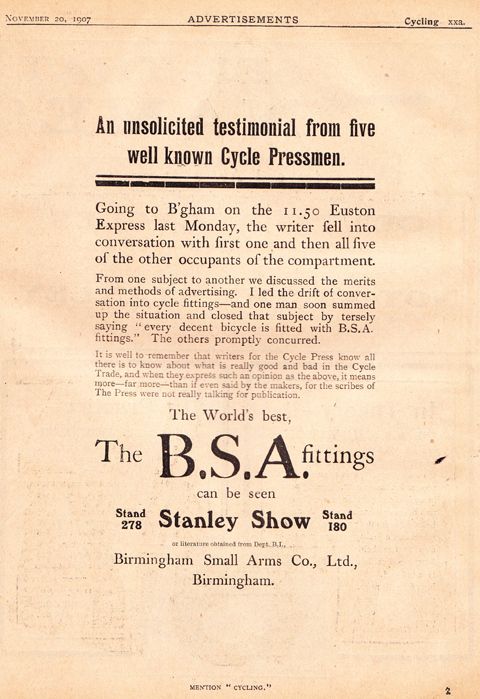 BSA’s advertising style for the 1907 Stanley Show is certainly impressive (see below). 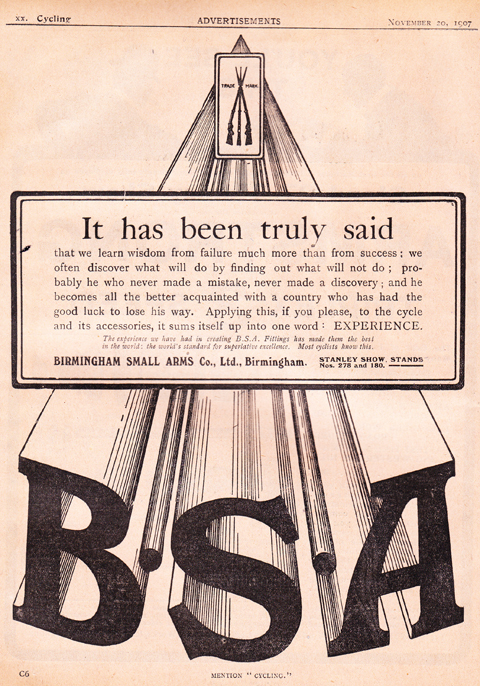 But, despite a superb advertising campaign, BSA had a big public relations problem at this time. 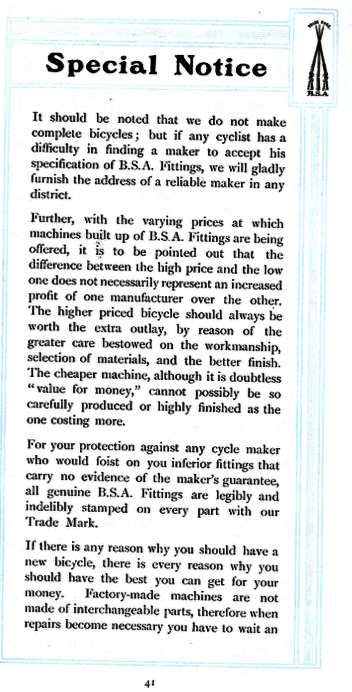 Some cycle agents had been installing cheap parts but selling their bicycles as genuine BSAs, and BSA had taken quite a few to court to try and prevent the practice. 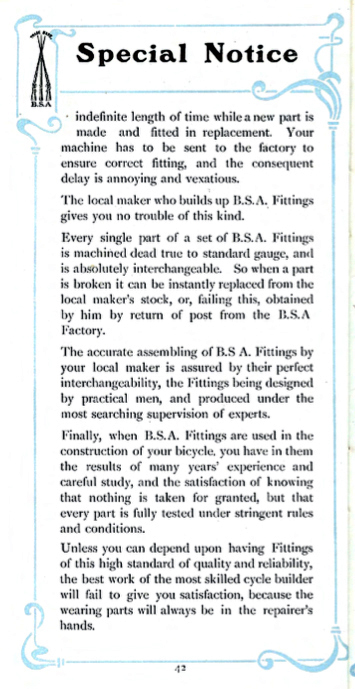 However, genuine BSAs also had a good secondhand value, and unscrupulous dealers made a good living selling as-new ‘knock-off’ machines in classified ads from rented accommodation and moving house promptly afterward, making them difficult to prosecute. 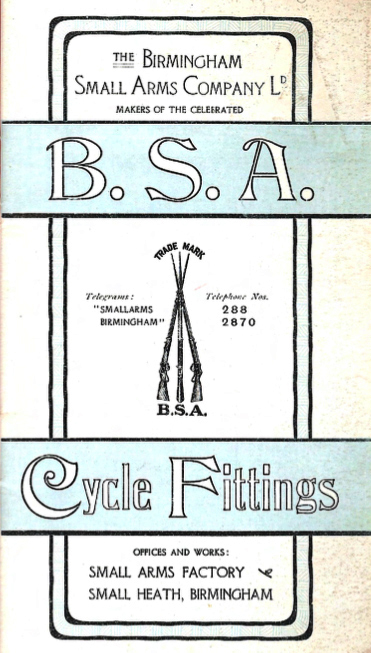 BSA exhibited a full range of machines at the November 1909 Cycle Show and, in 1910, new BSAs were at last available again to the public.